Trapper AN12 Electric Fencing Energiser. This Energiser gives you the best of both worlds; it can be clipped on to a 12v battery and used to power a fence in the middle of a field. OR plug in the provided adapter and the AN12 energiser is a mains powered unit with no more batteries to worry about. This gives the maximum flexibility so it can adapt to your changing fencing requirements. The energiser is made in Germany and comes with a 2 year warranty. Ideal for goats, larger paddocks and poultry nets. Max fence length; 8 km. Realistic length; 4.5 km. This energiser offers you the option of mains power and 12v battery power all from the same unit , so it is very flexible and at a very sensible price. 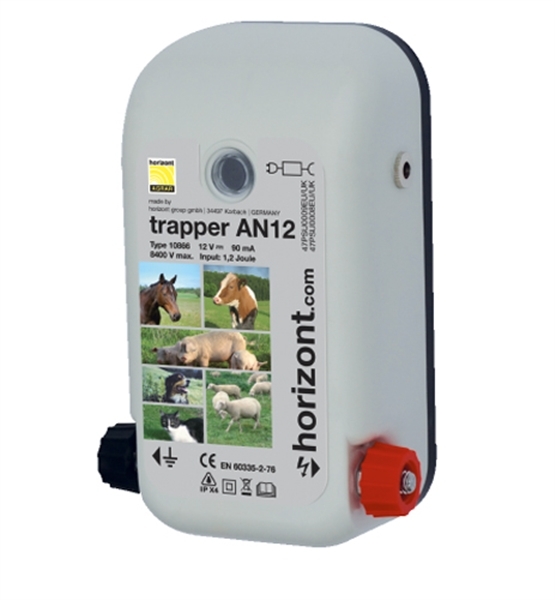 Plus with three different powered eneregisers in the Trapper range there is a unit to suit most requirements. Note: if you intend to use this as a mains energiser, you will need to get some lead out wire to run from the energiser to your fence.